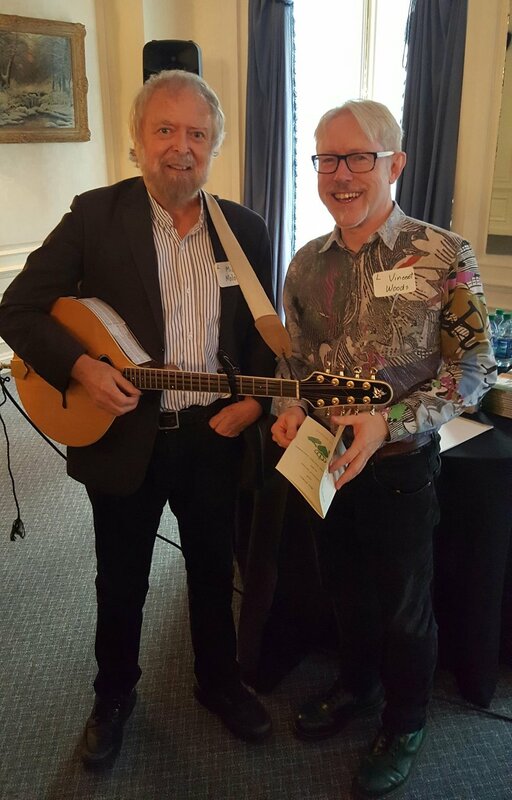 In November of last year the American Irish Teachers Association Conference included speakers Mick Moloney and Vincent Woods with a fascinating presentation on Songs and Poetry of the Great Famine. The next AITA conference will be held on April 14, 2018 at the NY Irish Center in Long Island City. In the spirit of Thanksgiving, I'm writing with sincere gratitude for all the support we received that made our 40th annual conference such a great success. 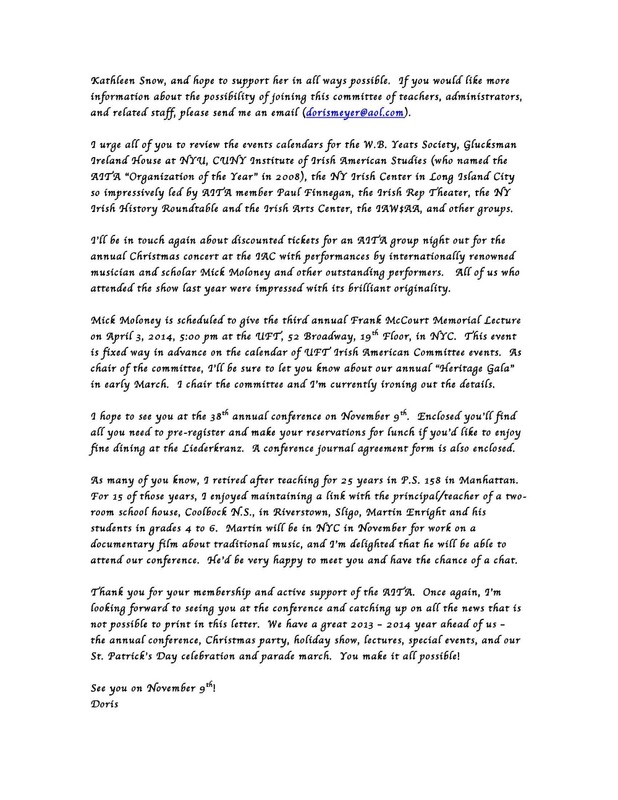 And in the spirit of the upcoming Christmas season, I'd like to remind you that the AITA holiday party will take place on December 15th at the National Arts Club, 15 Gramercy Park South, NYC, 10003. The cost is $15 for the reception only from 6pm to 7pm or $65 for both the reception and dinner which will be served at 7:30 pm. The dinner will feature wonderful music provided by the renowned Gabriel Donohue and Cathy Maguire. 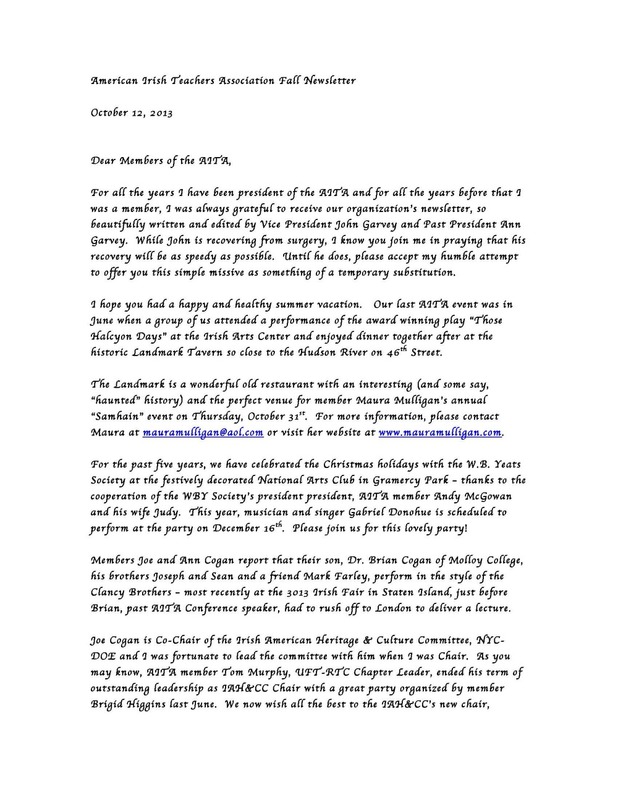 Send your check to the address above, payable to the WBYeats Society (who is co-sponsoring the party) to the Club by December 12th. If space permits, you may pay at the door for an additional $5.00. Please join us for what promises to be a wonderful evening! In addition, we are delighted to tell you that we received a special discount code from the Irish Arts Center for their annual Irish Christmas concert at Symphony Space, Broadway & 95th St., NYC. The concert features the legendary Mick Moloney and an all star cast of musicians and dancers. Use the code TMANIA241 to get two tickets for the price of one for shows on December 18, 19, and 20 -- That's $50 for two rear orchestra seats or $40 for two balcony seats. This is the biggest discount the IAC offers but you must order your tickets before December 1st by calling the box office at Symphony Space (212 864 5400) and giving the code. This is a very special offer and we hope you can take advantage of it! Information and guide for the public to petition the USPS to publish a postage stamp commemorating the centennial of the 1916 Easter Rising in Ireland seeking independence from Great Britain. For more information view the flyer below. There is a wonderful ticket offer for the Irish Arts Center's annual concert with internationally renowned musician and scholar Mick Moloney along with an all star cast of musicians, dancers, and special guests on December 18,19,20 and 21st at 5pm. All New York City public school students are eligible to enter a book making contest sponsored by the UFT Irish Studies Committee. This is a great opportunity for children to learn about the role of the Irish in the history of labor -- and win a gift certificate for Barnes and Noble. The legendary musician and scholar, Mick Moloney, has been a great friend to the AITA over the years. Mick has been leading tours to Ireland for over 20 years and this year, for the first time, travelers can join him on a cultural odyssey of Thailand and Vietnam. Please see the flyer or visit www.mickmoloney.com for more information. Please see Competition Timelines which provides you with a visual diagram outlining how the competition will work as well as some of the key dates involved. INDEPENDENT STREAM: Please see our Independent Entry Brochure. Please feel free to circulate this to whomever you think would be interested. It will also be available on the Consulate's webpage. Hard copies will be circulated to various Centers (a full list of locations will be forthcoming). Any child who wishes to enter independently must send their entries to The Irish Arts Center in New York by February 21st, a selection will then be sent to the Consulate. SCHOOL STREAM: Some groups have expressed an interest in working through particular schools or community group programs in their area or will be organizing their own "Children's Art Day". You will find a more in depth pack/curriculum in the School Pack. The Irish organization will be responsible for selecting the top ten entries from all entries generated by February 21st before sending onto the Consulate.